The Great Blue Heron is common throughout North America. They can thrive in diverse climates ranging from the frozen shorelines of Alaska to subtropic swamps and even deserts. They also have a diverse diet. Though mainly feasting on fish, they have been known to seek out frogs, turtles, salamanders and even gophers. I have been seeing them on a daily basis flying overhead. They are so massive yet graceful; they are hard to ignore. After about a week or so of seeing them everywhere I knew it was time to do another drawing and some research. They represent self-reflection. The Great Heron will seek out those who have lost sight of who they are or those who cannot seem find their place in the world. You must learn to look within yourself to find out the answers. If you wallow in self pity, low self-worth or are lacking pride in yourself, you will never reach your true potential. Like a heron hunting for fish, we must dive deep within ourselves. Listen to your emotions and allow yourself to flow like water down the path you already know is right. Heron asks us to recognize our inner strengths and weaknesses. See yourself with unrelenting eyes and figure out where you can improve and grow. Do not be over-critical of yourself, though. Being too judgmental could dampen your spirit even further. There lies a balance within us all and only you can figure out where your center is. Do not get lost trying to obtain perfection. There is no such thing. Do not try to blame others or the circumstances of life. Face your inner demons and take responsibility for your actions. We cannot grow if we can not face what is truly holding us back. This hit home for me. I am extremely over-critical of myself and have lost sight of where I’m going. So much heartache has followed us this year; it was difficult to let things rest and move on. I’ve been struggling to find my own way again but I’m trying to find my inner voice. The real me. Not the sugar coated one that hides her emotions for everyone else’s sake. It’s draining, physically and mentally. I need to be real with myself and real with the people around me. I need to stop worrying about trying to be perfect. I’m perfectly Meg and that’s all I can be. What about you? Have you seen a Great Blue Heron recently? Share your story in the comments below. Thanks for reading this weeks blog. I hope you enjoyed it! That is a very small list but there is so much to learn. Take time to do some “beesearch” and find more ways to make a difference! My latest ZIA was inspired by the bumblebee. I’m fascinated with how the tangles so easily flow with the natural world. At first glance, you see the bee. Then, upon looking closer, you realize the patterns within. I see patterns in everything now. Everytime I turn my head, I see a new hidden tangle and I want to draw everything I see! 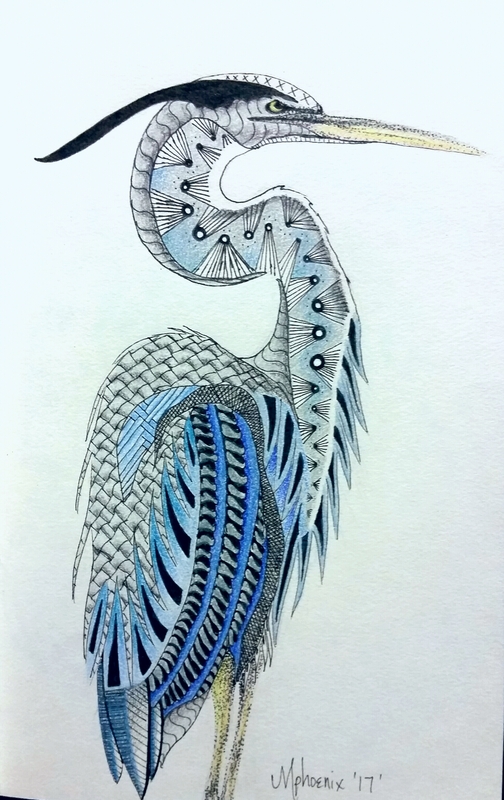 I am enjoying zentangle more and more. It gives me time to clear my head and concentrate on my work. It keeps me focused. It has become my therapy. It keeps me motivated. I hope your having a great start to spring! Remember not to squash the bumblebees if you see them! Consider yourself lucky that you’re in the presence of one. Thanks for reading! If you have any thoughts of your own on how to help the bumblebees thrive, leave a comment below!